We have had several e-mails asking about this, so we decided to put this page together with a few pointers to help identify the copy Air Crew Europe Stars from the real thing. The best way to identify the originals with confidence is to get your eye in and see as many as you can. 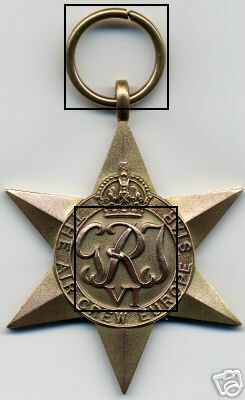 It is a good idea to compare it with the patterning on an original 1939/45 (or other known original) star - obviously the lettering will be different (but same style), but the rest is the same. New copies are obvious; they are just not of the same quality and could be spotted a mile away. Old copies are harder, but still fairly easy to spot once you've seen a few. Some copies are better than others and all seem to vary quite a lot. Most of the features are comparative to some extent - you need to know what an original looks like. Plate 1, An original Air Crew Europe Star with reference numbers for the pointers listed below. No break between the top of the V and the I in the numeral. The GRI design is not as sharp on some copies, the back of the G sometimes blends in with the circle more than it does on the original. On the original the point of the V in the VI points to the left hand tip of the top of the W in Crew. In some copies the V points to the centre of the W.
The central horizontal line is also useful....the A in Air and the last letter of Europe fall just below the line but balanced equally on either side - there is good symmetry on the original. 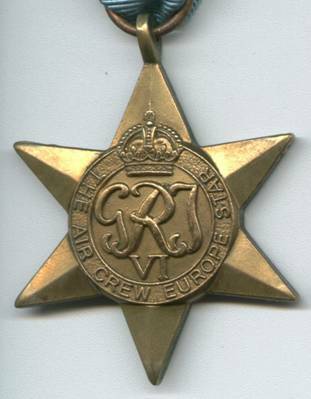 In the copy, the 'Europe' doesn't go round far enough and the full 'AIR CREW EUROPE' words are slightly lop-sided on the medal, it seems like they are rotated slightly clockwise around the circle. The W in Crew is a useful marker; on the original, the right hand lower point of the W lines up with the central line of the lower star arm, on the copy it is shifted left. Remember though that there is some minor variation between originals, mainly because the dies used to make them wear over time and different dies may have been used to make them. Plate 2. A very good copy of an Air Crew Europe Star. Note that not all the features are present on this copy, for example: the V and I join at the top, like an original. This copy does show the clockwise rotation of the words ‘AIR CREW EUROPE’ though, and some of the features are blunter than on an original, e.g. 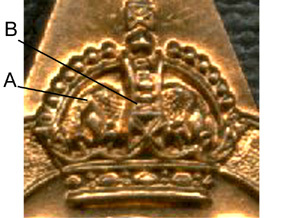 the crown features and the GRI. Note the brass ring as well. Plate 3. 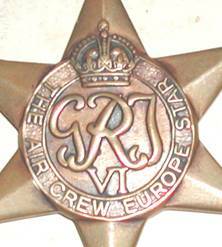 Close-up of the crown on a copy Air Crew Europe Star. 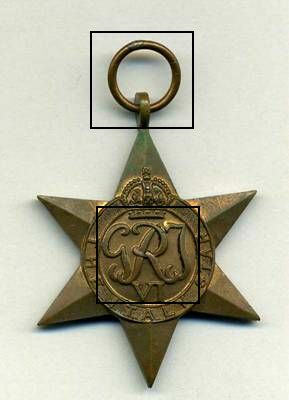 This is a different medal to that shown in Plate 2. Note the bluntness of the feature marked ‘A’ and the fifth full pip in the central band, marked ‘B’. Plate 4. 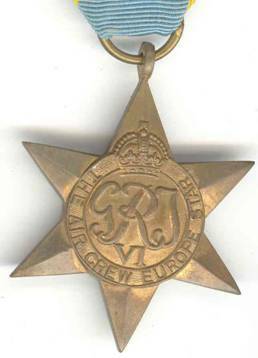 Close-up of the crown on an original Air Crew Europe Star. This is a different medal to that shown in Plate 1. Compare the features marked ‘A’ and ‘B’, where there is only half a pip, but also the general appearance. 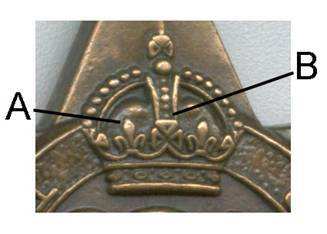 The crown generally has more detail, depth and texture, but some of the features on the copy can look cleaner than on an original, the orb under the top cross for example. Plate 5. Another copy, but a different variety. Note the large loop around the middle of the 'R' in the cypher. The 'W' in 'CREW' is offset clockwise, as is the end 'E' of 'EUROPE', but not as much as in Plate 1. Thanks to Alan Jackson for the photo. Plate 6. 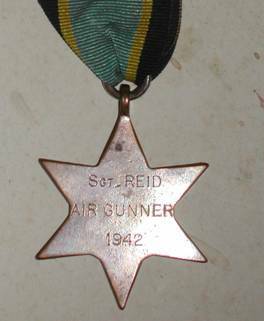 Another example of a copy, this time named on the reverse to an air gunner. This name appears on the casualty list, so if it were genuine it would be very interesting. This was recently offered for sale. Plate 7. …and the back, with the engraved naming. Since the 1970s, WW2 stars have been issued as replacements, or first issues, with a larger suspension ring. This is generally unsoldered and looks too big compared to original post war issues from the 1940s/50s. The stars are, however, genuine and can be separated from the copies in much the same way as suggested above. Thanks to Damien for supplying the following pictures of an excellent example. In the first and second images, the squares are drawn for reference and are the same size within pictures. For the Air Crew Star you can see that the suspension ring is about the same diameter as the inner circle on the star face, for the original issue stars (here an Italy Star for reference), the ring is much smaller and typically narrower than the GRI cypher. There are a lot sold on auction sites as 'not sure if this is genuine or not', but they are all copies – I sometimes think the element of doubt is included only to raise the price for people hoping to get a real one cheaply, but they'll either be disappointed or fooled! If you are unsure about one, don't buy it . Only buy one from a source you are confident about. If you want to be 100% certain you should only buy from someone with a good reputation who will offer a money back guarantee that the medal is original. This page may not be reproduced in any form without the author's permission. My thanks to Ian Hartley for allowing me to use his text and graphics on this page.